My new favorite Indian spot to eat at in the city is luckily just a block from our office! It is called Indikitch. Everything is made with all natural ingredients and is all GMO free. The food here is actually really delicious. I have had a lot of Indian food, even some really good places right in the town where I live, and obviously on our trip to India, but being able to satiate my Indian food cravings quickly on my lunch break, with tasty Indian food at that, is so nice. Love it. 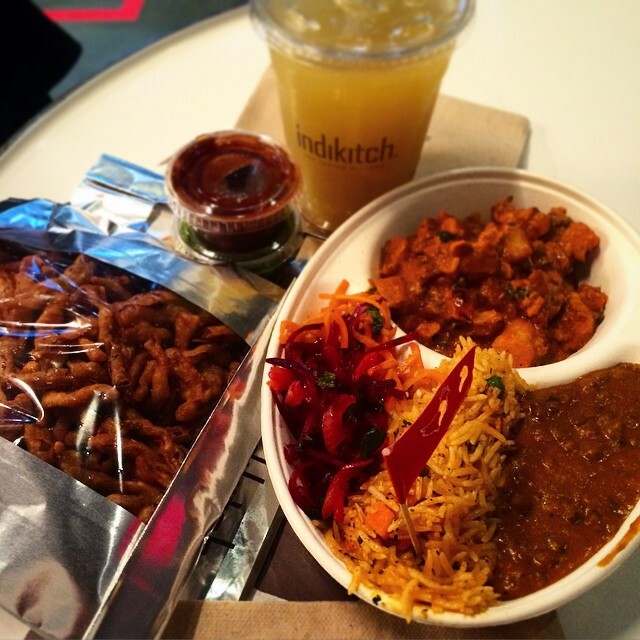 Indikitch is basically Indian Chipotle, except the protein of the dish is cooked to order. When you get to the counter you choose the type of meal you are getting, what type of protein and how spicy you would like it to be. They have little flags that signify the protein you are getting and how spicy it will be. There are 3 vegetarian and 3 non vegetarian options, one of which is a fish option – Goan fish. You then choose your sides and sauces. So far I have only been there a few times. My first time, which was right before we were leaving for India back in March haha, I got the Feast meal with chicken tikka masala extra spicy with beet salad, saffron rice, traditional dal and naan. Everything is really delicious, hot and fresh. Recently we tried out their bhaji onion chat and samosa chat and they are very good too. The next thing I want to try out is one of their Live Fire salads with the Goan fish. I saw a girl getting it the other day and it looked really good. It is a bowl of romaine, red cabbage, cilantro, lemon yogurt dressing and fresh mint, topped with the main of your choosing and coconut and coriander pestos, served with chickpea chips. Sounds and looks delicious. The one thing here I wasn’t very happy with was the ginger sugar cane juice, it was not as good as it sounded. I am lucky that this spot is so close to where I work. Everything is reasonably priced and a good amount of food. I love that they have the candy coated fennel seeds on the way out too. I can’t wait to try out more of their dishes! I hope to get some better pictures on my next visit too.